As promised, I’m really pleased to introduce Steven Harper, author of IRON AXE, the first book in a wonderful Norse-inspired series about an outcast, half-troll boy given an earth-shattering (or saving) mission by Death herself. Publishers Weekly says of it, “Harper begins the Books of Blood and Iron series with an exciting and somewhat unusual quest… His reinterpretations of trolls, giants, and fae folk give this series opener a fresh feeling, while his nods to Norse mythology and folklore root it strongly in fantasy tradition. 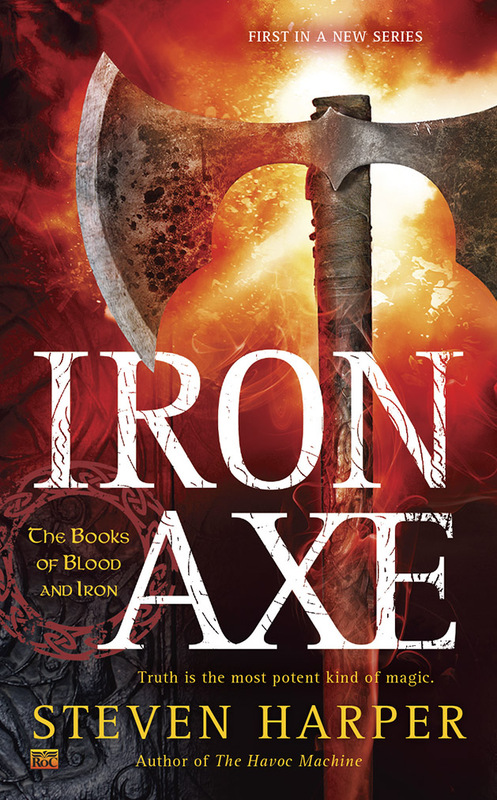 Readers will be eager to see what’s in store.” If you want to see what’s in store, comment below for a chance to win the audio edition (via Audible) of IRON AXE! When I was sixteen, I doodled a map of a city with a strangely-shaped harbor. Eventually, I wondered what the country around the city looked like, so I doodled that, too. Then, just for fun, I drew the countries around it, and eventually the continent. By now I had so much time invested in it that I had to keep going. I got some good drawing paper and colored pencils and put in the terrain and geography. I worked out weather patterns. Then I worked out the people. Since I liked fantasy, the place became a fantasy world. This country was ruled by elves. This one by humans, but it was fragmented like Europe in the 1700s. This country was for dwarves, and over here, merfolk. I created gods and goddesses as well, nine of them in all. The notes grew and grew, and I put them into a big blue binder. Since I called the world Terra, the binder became the Terra File. Over the years, I used the Terra File on and off. It was a role-playing game for a long time. I wrote a couple of short stories set on Terra, but nothing major. Eventually, I put the Terra File aside and forgot about it. Then I talked to my editor, Anne. We were at World Fantasy Con, and she wanted to know what my next writing project would be. I pitched several ideas, but none grabbed her. Finally, in desperation, I remembered a short story I’d written years ago about an outcast teenaged boy who was half human, half troll. I’d always wanted to write a novel about Trollboy, so I pitched that. The setting was historical Norway, and I’d done a fair amount of research into Viking culture. Think fast, Steven. Think! And I remembered the Terra file. Back home, I dug out the Terra file and went to work. A couple weeks later, I had my synopsis and was working on IRON AXE, the first novel in the Books of Blood and Iron. Trollboy lives! It pays to keep an emergency back up. Fun fact of the day: Steven Harper (aka Steven Piziks) and I go way, way back to the week of my wedding, ‘lo these many years ago. He had a debut novel and an offer on the table. I fell in love with the novel (IN THE COMPANY OF MIND) and ended up negotiating his contract and tying the knot with my husband all in the same week. Needless to say, it was a pretty good week. Enter “fanfic” into Google and you get about 9,900,000 results. These results include fan fiction sites for Harry Potter, Twilight, Zelda, Naruto, the Jonas brothers, Lord of the Rings, and yes, even Star Trek. Fanfic writers spend hours laboring over their own stories about Harry’s post-Hogwarts adventures or Bella ditching Edward or Sam declaring his undying romantic love for Frodo. And some people snort in derision. Such a waste of time. What an utter lack of creativity. You’re stealing someone else’s work. 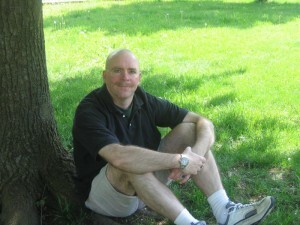 I’m what people call a “real” writer, in that I’ve written and sold a dozen-odd books to New York publishing houses. And I started by writing fanfic. When I was in college in the late 80s, I joined a group called Stellar Operations Command, a group that combined fanfic with role-playing. We used the Star Trek universe, but not the Star Trek characters themselves. You created a main character and assorted minor characters for yourself, and you were put on a ship with about six other people. Every month, the captain sent out “orders,” basically an overview of what was happening on the ship, and then you wrote a story about your character’s adventures. You could also include other people’s characters, but you couldn’t kill or otherwise change them. You mailed a copy of your story to everyone else in your group, and they mailed their stuff to you. (This was before e-mail, so everything was done on paper.) Stellar Operations Command was huge, with hundreds of members nationwide. Weirdly, it didn’t survive the Internet, and it faded away in the late 90s. Such a shame. My character was the communications officer on his ship, and his name was Rusty. He had several friends–a med-tech named Randy, a security officer named Nora, a Kaatian science officer named Mrrit. I must have written 300,000 words about them during my tenure with SOC, enough for three novels. And by god, I loved every minute. Why? SOC fanfic granted me freedom. Since the setting was already created for me, I could concentrate on character. I had a dump truck of fun developing Rusty. He was one of the first long-running characters I created, and still I miss him sometimes. SOC also forced me to write. With a monthly deadline, I had to get to that keyboard on a regular basis. Between SOC and my job at a local newspaper, I learned to write to a deadline, a skill that has served me well over the years. Finally, fanfic was a safe place to romp around in. I could do nearly anything I wanted, write purely for myself, tell stories on paper just for fun. I could take risks, be silly, stupid, or outrageous, safe in the knowledge that the other members of my ship would still read every word. That meant a great deal to me. In the process, I learned how to write realistic dialogue, describe people and places, set a scene, build suspense, add plot complications and foreshadowing. And then I sold a Star Trek book. And a Battlestar Galactica book. And a Ghost Whisperer book. Know what? They’re all freakin’ fanfic. And they paid very nicely, too. Still think fanfic is a waste of time? Since my writing went pro, I’ve been forced to give up fanfic for the simple reason that I only have so many writing hours per day, and I have to choose the one that will support my family. But a waste of time? Steven Harper usually lives at http://www.theclockworkempire.com and http://spiziks.livejournal.com . 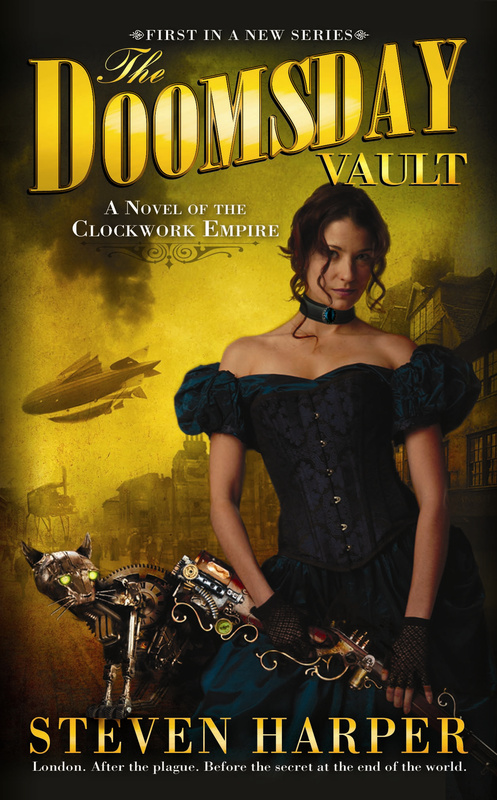 His steampunk novel THE DOOMSDAY VAULT, first in the Clockwork Empire series, hits the stores in print and electronic format November 1.